As the title of Sean Dack’s exhibition suggests, the photographs and sculptures on view are mere ghosts of their origin—nostalgic, yet isolated and expendable. Each of the fourteen photographs in the gallery displays a highly distorted digital image of random subjects, including various girls, a helicopter, a hotel, and an airplane. Oftentimes distorted and abstracted beyond recognition, the images present the illusion of an interrupted television broadcast or internet stream. 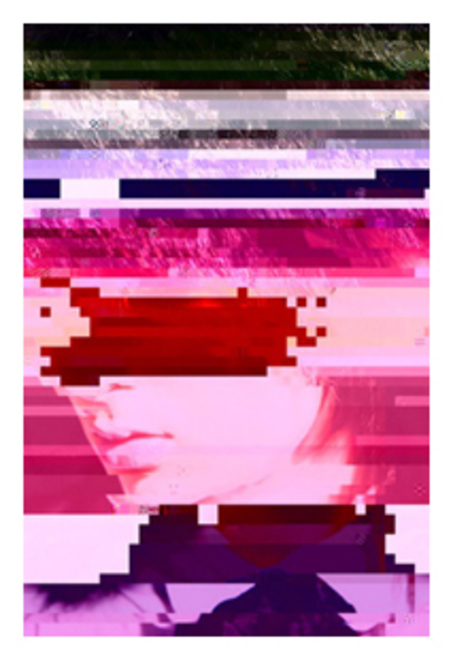 Dack digitally manipulates the image by “pixelating” the surface and giving it a pop hue of bright pinks, yellows, and greens. These disruptions ultimately force the viewers to decipher an image that they were likely to have otherwise overlooked, and thus pause and reflect on its source and original context. The sculptures in the exhibition are all rubber-encased electronic components of now-obsolete audio technology such as a tape cassette deck and a CD changer. Clumsy and awkward, these relics of a long-gone age further emphasize Dack’s romanticization and adherence to the imperfections inherent to our technological surroundings. *Images: Girl Next Door (2008); Untitled (2008). courtesy the artist and Daniel Reich Gallery. Would be realy interesting to be physicly there to experiënce the works. Regards, Jan Kölling.